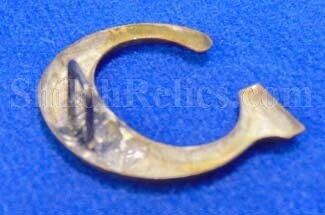 This is an excellent original non-excavated Civil War company hat letter insignia. 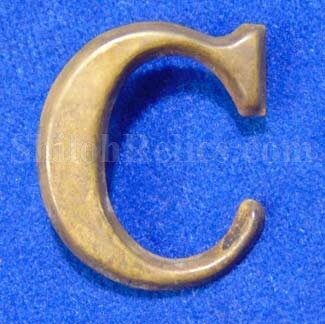 This is the letter "C” which would stand for the "C” company designation in the regiment. 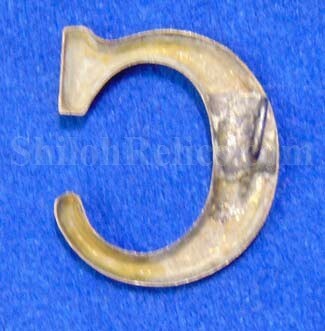 It is made out of stamped brass and it measures 1 inch by 7/8 inch in overall size. It has a wonderful untouched darker tone to the brass and even has the original attachment loop present on the back. This is a fine non-excavated piece of insignia. This piece came from the massive collection of Bannerman in New York. Bannerman bought up the Civil War surplus from the government after the Civil War. He and his family sold these authentic Civil War pieces for decades. This is a perfect piece of Civil War history that is still affordable.